On the 3rd day in Rome, we took our time to get ready since we were super tired from walking non-stop the day before. On our itinerary, we were supposed to visit Colosseum and Roman Forum that day but we finished them the day before! So, yeah… we planned to have a light day and enjoyed the charming Rome. Our first destination was Campo de Fiori. This area is well known for its outdoor market in the morning and vibrant restaurants at night. From our apartment (Piazza Navona area), we walked south passing Piazza Navona and took a bus from Palazzo Braschi – near Museo di Rome. We bought 3 days ticket for €11 the day before and it can be used for all means of transportations around Rome (bus, tram, and metro). When we got off, I was a bit disappointed since the market wasn’t as big as I thought would be. There were some stalls selling fruit, herbs and spices, cheese, and a flower shop at the corner. We bought nectarine, green grape and fig, as our snack – I was not happy when I found that the fig was sour 😦 At one of the shops, I saw that it sells one small truffle for €45! Crazzzyyy!!! One of the shop sells truffles for €45 each!!!! Since there wasn’t much too see around there, we took the metro line B from Piramide to Basilica San Paolo. When we walked out from the metro station, the area looked so quiet. I was complaining to my hubby that we hit another disappointing site. He suggested that we walked around the block in case we were at the wrong side of the church. I followed him and kept complaining since it was a super hot day! Luckily, his instinct was right! We arrived at the front gate of Basilica of Saint Paul outside the Walls just around the corner. As soon as I saw this beautiful church, my grumpiness was gone. In fact, this church is the only one that I still vividly remember inside and out after my trip! The front porch of the church has 12 apostle names and fresco on top of each arch. 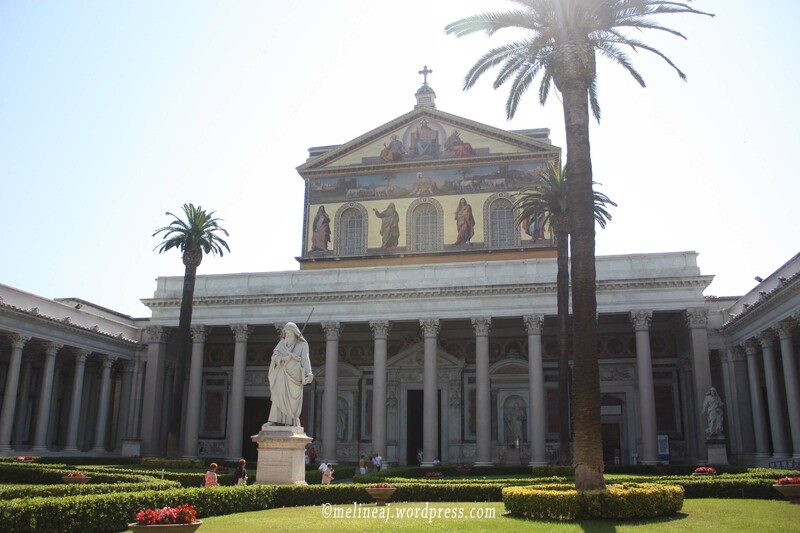 There is a small garden at the front of the church with 4 palm trees at each corner and a statue of St. Paul at its centre (since this basilica actually has the tomb of Saint Paul inside). The presence of gold mosaic on top of the church makes this church so unique. We walked on the east side of the atrium toward the main door while admiring the beautiful ceiling above. 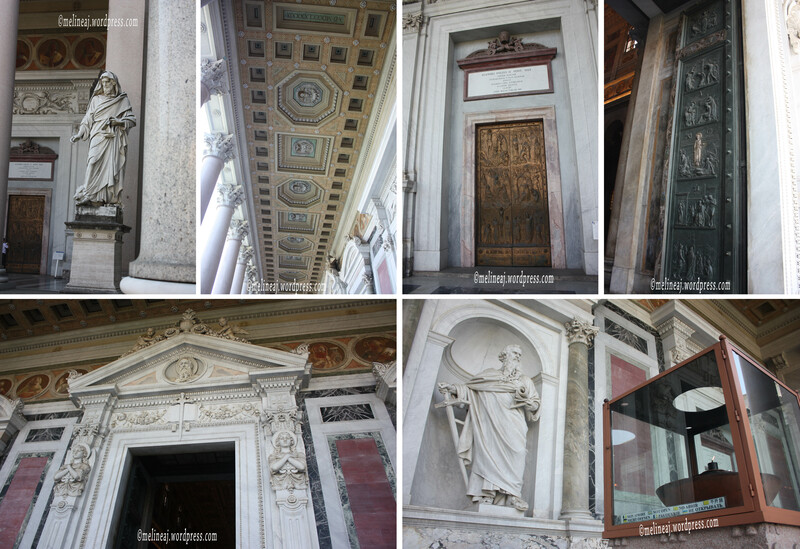 There are 2 doors in front of the basilica: the golden Holy door and the bronze main door. The Holy door was closed and according to my research, it only opens during Holy Years. The main door looked like an ordinary bronze door. However, when we left the basilica, we noticed that when the main door closed, the middle of the door resembled a cross. From the main door, we were amazed by the golden theme inside the basilica. The ceiling was beautifully crafted and painted with golden paint on top of white background. On the upper part of the nave wall, there are a series of painting depicting the life story of St. Paul from his conversion, his missionary trips, and his martyrdom. 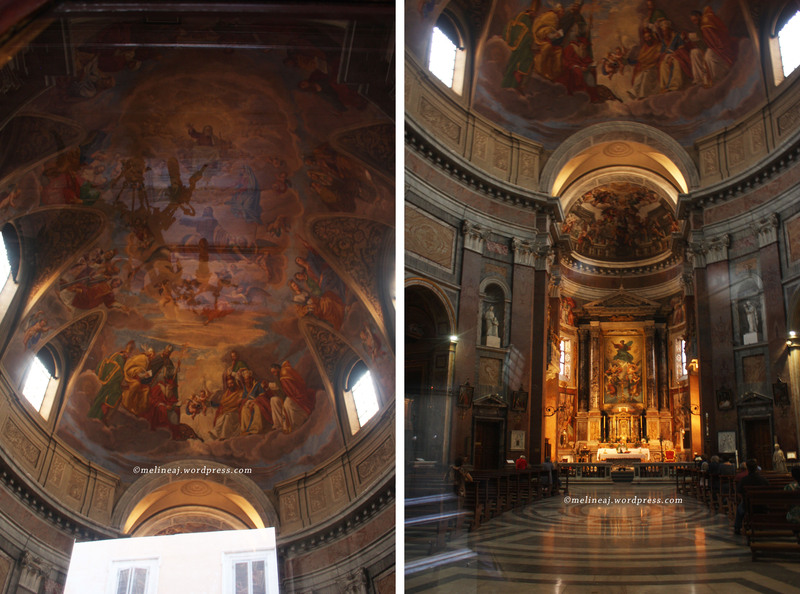 Below these paintings, there are portraits of the pope from Peter to Benedict XVI. However, the most noticeable thing once we entered was the lit up gold mosaic apse. The apse shows the portrait of Jesus in the middle along with apostle Peter, Paul, Andrew, and Luke. 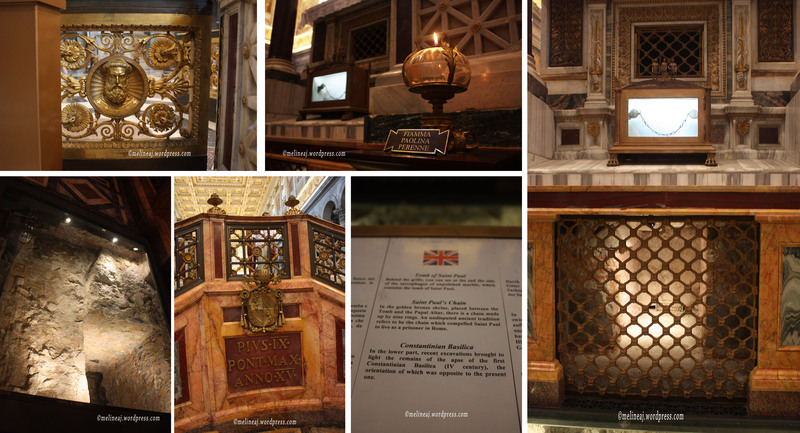 Walking toward the main altar, we reached an opening with two downward staircases to the tomb of St. Paul. We saw a little piece of white marble sarcophagus behind a grill that was believed to contain the remains of St. Paul. Above it, there’s a box displaying chains that were used by St. Paul in prison before his execution. Over the tomb, the high altar stands elegantly. On the right side before the tomb, we saw a tall marble column with carvings on it that is called paschal candlestick. On the left wing of the main altar, there is Altar of Conversion. The altar was made from emerald green malachite & bright blue lapis lazuli that makes it so noticeable from afar. Still on the left wing, there’s a Chapel of St. Stephen and Blessed Sacrament Chapel nearby. On the right wing of the basilica, there are two other chapels: Chapel of St. Lawrence and Chapel of St. Benedict. After we finished admiring the grandness of Basilica San Paolo, we decided to visit another church, Basilica di Santa Maria Maggiore. This is the biggest church in Rome that is dedicated to Virgin Mary. 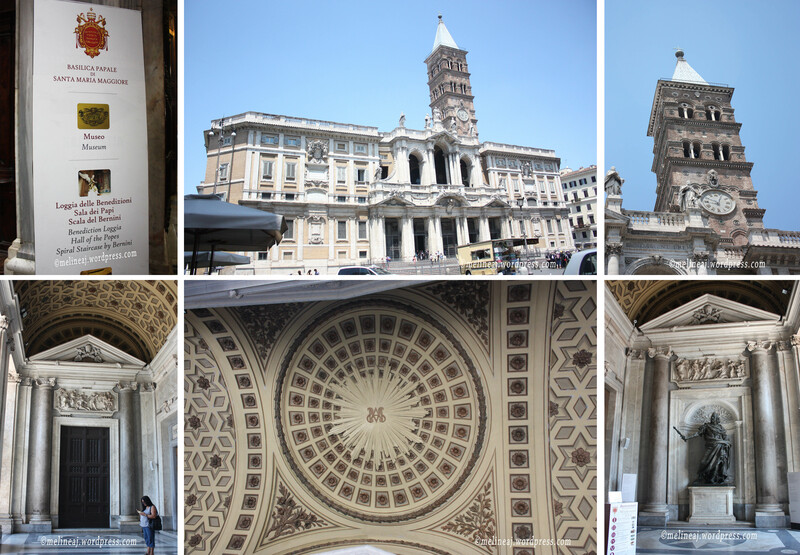 From Basilica San Paolo, we took metro line B to Termini and walked to the basilica. The only thing that differs this basilica to others was the presence of the bell tower at the east side. According to the legend, this church was built according to the layout of a miraculous snowfall in August. Similar to other basilica around the Rome, the interior of this basilica was mainly decorated with large marble column and it has gold painted ceiling above. 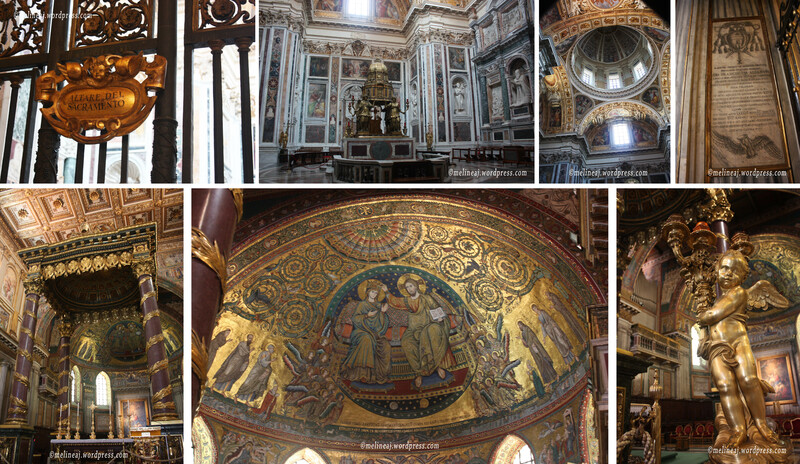 The apse of the basilica shows the mosaic of Coronation of the Virgin in which Christ shares a throne with Virgin Mary while crowning her – unlike the traditional apse mosaic in other basilica in which Christ is the only one at the centre of the mosaic. Thus, it reaffirms that the basilica is dedicated to Virgin Mary. On the right side of the high altar, we saw a gated chapel called Sistine Chapel – not to be confused with Sistine Chapel in Vatican City. Inside this small yet beautiful chapel, there is an altar with four bronze angels holding a tabernacle on top. The design of the sculpture resembles the canopy of the chapel itself. Under the altar, there’s a crypt containing the “fragments of the sculpture of the Nativity from 13th-century made by Arnolfo di Cambio” (ref). Since we couldn’t enter the chapel, I only took pictures from the gate and yet, the apse of this small chapel was breathtaking! Approaching the main altar, we went down to the confessio just before the high altar. There’s a white marble statue of Pope Pius IX. At the altar, there was a box containing the reliquary of “Santa Culla.” From afar, you may not be able to see what inside the container. When I zoomed in my photos in my camera, we were able to see that the container contains pieces of woods. These woods were believed to be the remains of Holy Manger in which Christ was laid when he was born in Bethlehem. 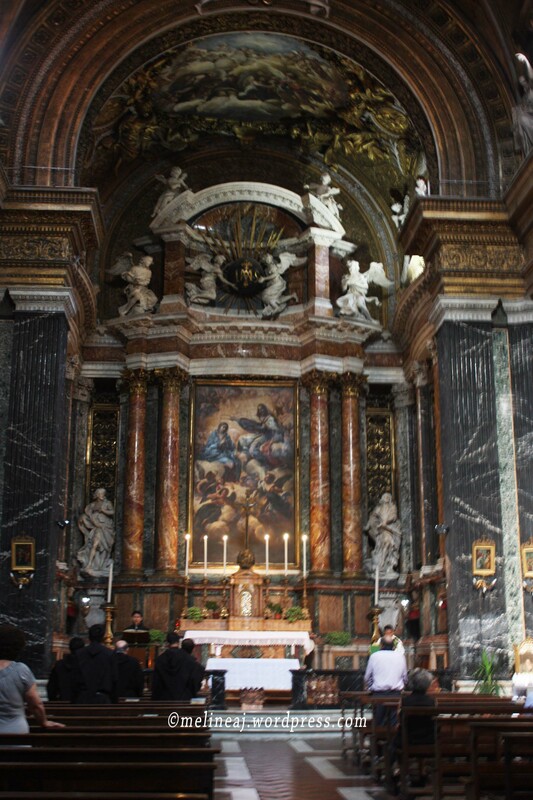 Among the tomb of famous people inside the basilica, Bernini‘s tomb is one of them – you can find the sign at the right side of the high altar . At the east wing of the basilica, we entered the Baptistery. Around this room, we saw a lot of tombs. The baptistery was actually gated and at its the centre, there is a black circular basin. Behind it, there’s an altar and the most interesting thing was a glowing yellowish window on top of the altar showing the symbol of “Eye of Providence” – an eye within a triangle surrounding by the angels. You can find the similar sign at the back of American one dollar bill. *I was surprised that there was not a lot of websites covering this beautiful part of the basilica. I had to dig deeper for my research on this information. Yet, the baptistery was the main thing that I remembered about this basilica – yeah… I’m a visual person and a symbol fan, so the eye of providence was kinda imprinted on my brain 😛 * On the west side of the baptistery, there was a small store selling various Christian accessories. Here, we found a cool book about Rome. The book has several pages showing Rome in recent day and when you flip a page, it shows how it was in the olden day. I wish every history book has the similar concept. If I had this when I was in high school, it would be so much interesting for me to learn about history. 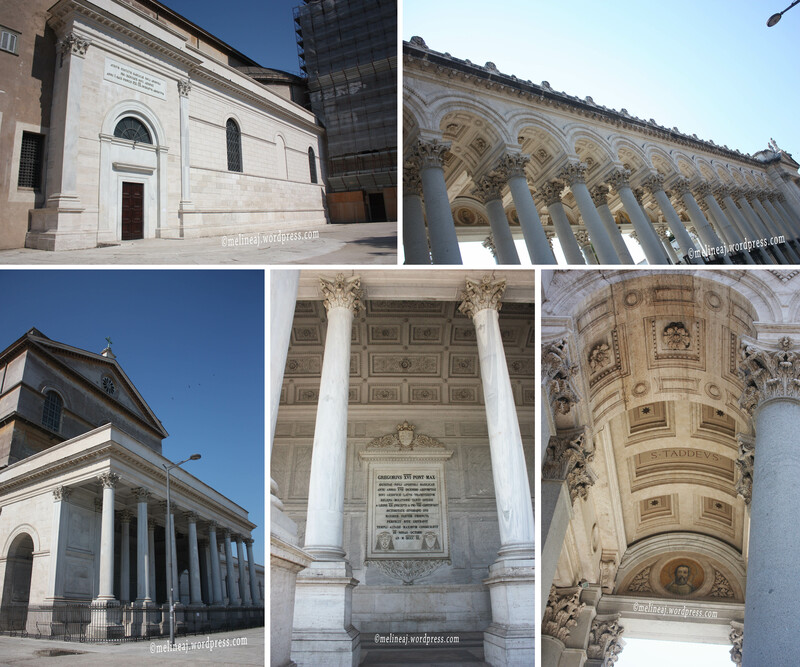 Our next destination was Arcibasilica Papale di San Giovanni in Laterano. This church is the cathedral of the Pope; thus, it holds the highest rank among other Roman Catholics churches including St. Peter’s Basilica. This major basilica (along with St. Peter’s Basilica, Basilica of Saint Paul outside the Walls, and Basilica di Santa Maria Maggiore) is guarded by Vatican City police although it is located in Rome. Across the basilica, Triclinium Lenoninum stands with its orange brick wall. This structure was the original part of Palace of Lateran that was demolished in the late 16th century due to the order of Pope Sixtus V. Prior entering the basilica, we saw several statues on top of the basilica (Christ, St. John the Baptist, John the Evangelist and other saints – ref). On the second level of the basilica balcony, there’s a Loggia of Blessing in the centre. This is where the new elected Pope gives his blessing on the day he takes possession of the cathedral. 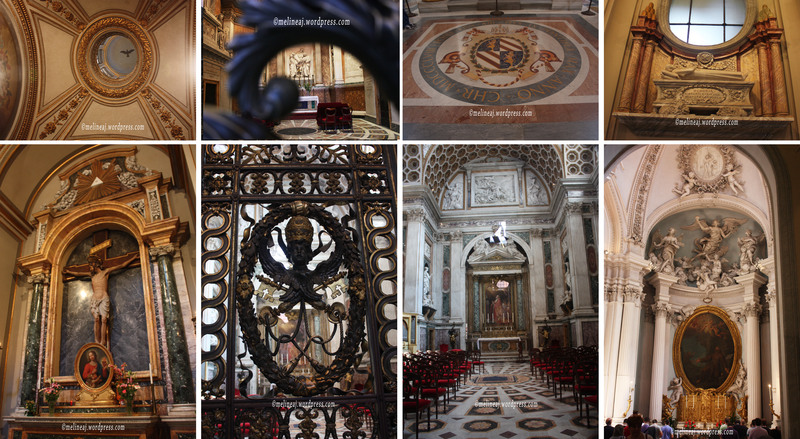 Unlike the shiny golden decorations inside Basilica San Paolo & Basilica di Santa Maria Maggiore, Archbasilica of St. John Lateran has a darker interior design although it still maintains the golden theme all around. Along the nave of the basilica, there were statues of 12 apostles all around. In the middle of the nave, there’s a confessio containing the tomb of Pope Martin V. The confessio was closed for tourists and I wasn’t sure why people throwing coins and bill on top of the tomb – I found it a bit disgraceful 😦 As usual, the high altar stands tall over the confessio. Below the apse, there isn’t any main altar. 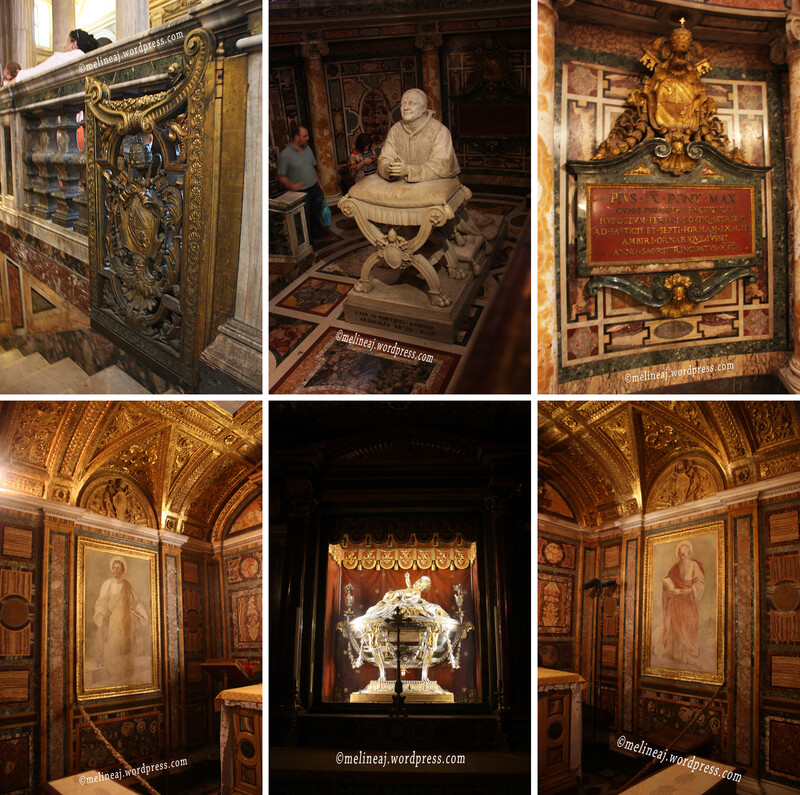 Here laid the Papal Cathedra (Bishop’s throne) – this section was closed so tourists can only took picture from afar. At the altar of the Blessed Sacrament, it was believed that the table there was used by Christ at the last supper. There are many other smaller chapels around, such as Orsini Chapel, Torlonia Chapel, Massimo Chapel, Chapel of the Crucifixtion, etc. We missed the baptistery at the back of the main altar since this octagonal building is a separate from the basilica and the entrance is from the outer side of the church. Extra tips: when you exit the basilica, don’t forget to go to Scala Sancta on the east side of the piazza. This marble staircase was also the original part of the Lateran Palace. It was preserved since it was believed that it is the stairs from Pontius Pilate’s palace on which Christ climbed on his way to the trial. According to the tradition, pilgrims around the world climbed the 28 steps using their knees to mimic the passion of the Christ. This staircase leads to Chapel of St. Lawrence at its top. Sadly, we missed this site while visiting Rome. Otherwise, it would be a great experience for us. By the afternoon, my ankles hurt so bad and I was pretty sure that I got tendonitis 😦 My husband and me tried to find a pharmacy nearby and bought elastic bandage to wrap my feet and ankle so that it might lighten the sharp pain. We rested for awhile while having lunch in a small pizzeria that sells pizza by the weight! *interesting hehehe…* They have various selections of pizza and some are unique too, such as shrimp pizza. The pizza was not bad and the price was okay too. With full stomach and recharged energy, I decided to continue our exploration – I didn’t want the pain to ruin my dream trip! Next, we took the metro to go to Piazza del Popolo. 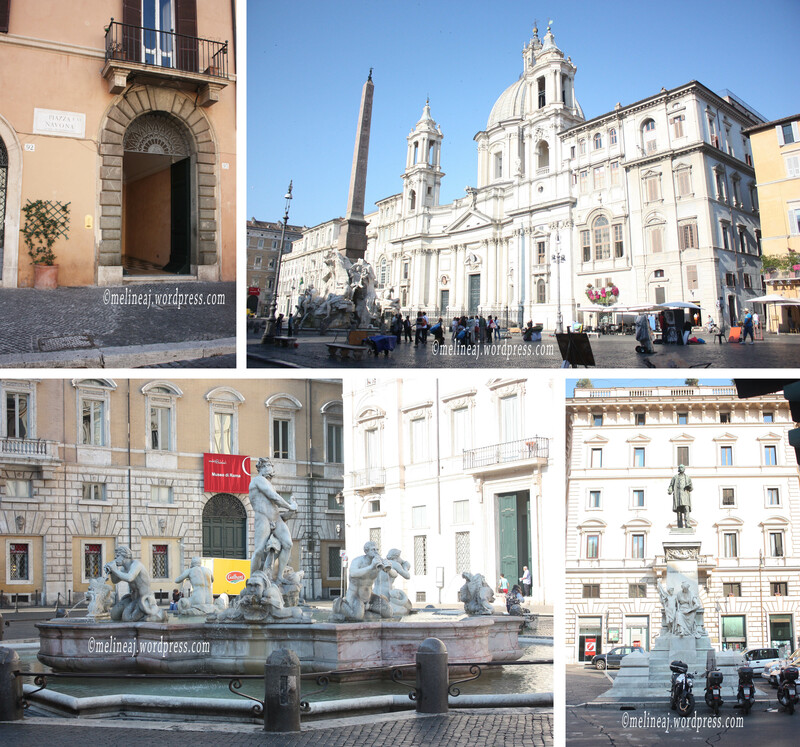 As soon as we walked out from the Flaminio metro station, we saw Porta del Popolo nearby. At the back of the portal, it’s the start of Via Flamina. 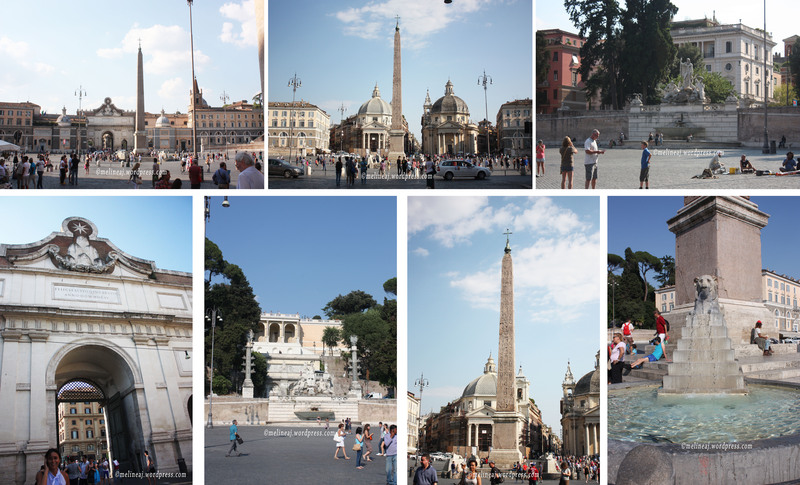 At the centre of this big piazza, the Egyptian obelisk of Ramesses II, called Popolo Obelisk, stands tall. This is the tallest obelisk in the Rome! When looking to the north side, we saw 2 twin churches: Santa Maria in Montesanto (on the left) and Santa Maria dei Miracoli (on the right). These churches mark the start of 3 different streets leading to the city: Via del Babuino (left), Via del Corso (middle), and Via di Ripetta (right). On the east side from Porta del Popolo, there is a small fountain called Fontana del Nettuno. On the opposite side of the piazza (west side from Porta del Popolo), there is another fountain with steps leading up to Pincian Hill. Apparently, when you on top of the Pincian Hill, you’ll get a great view of Piazza del Popolo with St. Peter’s Basilica at the far background. We didn’t climb to the top of Pincian Hill; instead we decided to go back to the apartment to give my ankle some rest. We decided to walk to our apartment since taking metro didn’t make our trip shorter. My hubby said that Via di Ripetta was the shortest distance to go back to apartment. On our way, we passed the twin churches. Since Santa Maria in Montesanto church was closed and under renovation, we entered Santa Maria dei Miracoli – the one on the right. This church was small but still it was charming. Exiting the church, I saw that Via del Corso was more crowded with people than Via di Ripetta. Turned out, Via del Corso that is one of shopping streets in Rome. Against my hurting ankle, I stubbornly insisted to walk along Via del Corso although it made the trip farther. *Hey… a girl needs window shopping too, right?! hahaha…* There are so many shops along this street, such as Adidas, Nike, H&M, Puma, Apple store, Disney Store, Diesel, etc. Since we hadn’t really shopped, we took our time to enter the shop if we saw anything interesting. There were also a lot of interesting street performers, such as the spray-paint drawing guy and the levitating men. Rome is really a city with HUNDREDS churches. 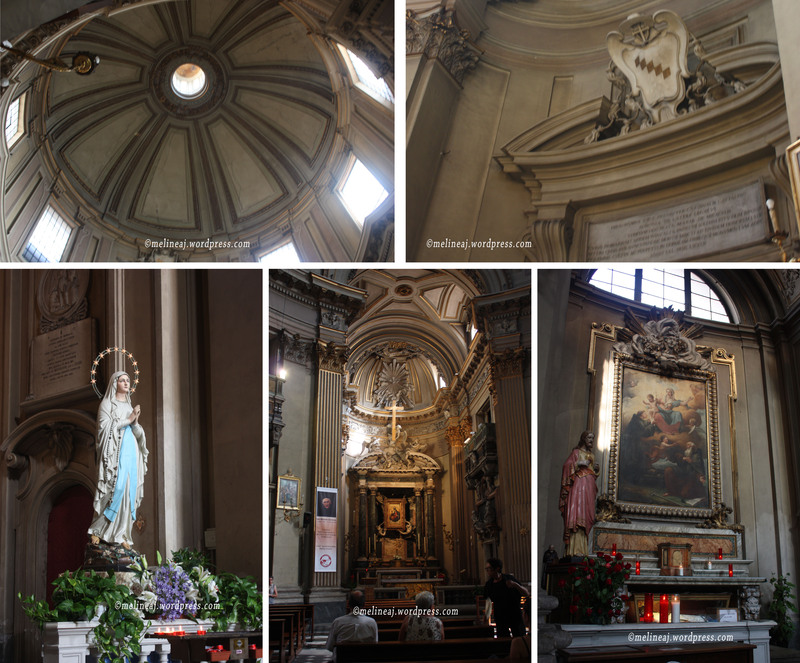 On Via del Corso, we passed several churches, such as San Carlo al Corso, Chiesa di San Giacomo in Augusta that is dedicated for St. James the Greater, and Gesù e Maria – located across Chiesa di San Giacomo in Augusta. We rested for a good couple hours at the apartment as we packed up our luggage since we thought it’s our last night in Rome. During our stay in Rome, we had problem with the internet connection at the apartment. We tried to contact the host and yet, the internet didn’t work. Plus, when I was in vacation, I seemed to forget the day and date. When I looked at our plane ticket and looked at my calendar on my iPhone, I found out that we actually had one more night in Rome! DUH!!!! Lucky, we didn’t drag our luggage all the way to the airport and found out that we were too early! hahahaha…. Since we pretty much covered the tourists sites that we wanted in Rome, we had to do more research on other tourist attractions there. So, we had to find a free Wi-Fi nearby. Fortunately, not far from our apartment, there was a restaurant that offers free Wi-Fi. Since we didn’t want to eat at the restaurant, we just sat across the street (in front of a rug store) to steal the free Wi-Fi hahaha…. Then, I remembered that Florence was only an hour away from Rome by train. I checked TrenItalia website and found that return train ticket from Rome to Florence was only €86 for 2 people (since they had 2 for 1 promo), so I suggested my husband that we should go to Florence. However, my husband strongly opposed my suggestion since he wasn’t comfortable with my instantaneous idea. He claimed that if we went there, we wouldn’t know which attraction to go and it would be a waste of time. Being stubborn, I did quick research for Florence tourist attractions. As I remember from reading Dan Brown’s Inferno, there are Boboli Garden, Palazzo Vecchio, and Cathedral of Santa Maria del Fiore (duomo). When I showed him my quick research, he still insisted that he didn’t want to go to Florence. So, I was super mad at him! Finally, I just gave up and followed his lead to do more exploration in Rome.